Stick it!— GIjOE/Cobra fan and pin creator, Mae Catt models her latest creation, a unique “Cobra Enemy!” cloisonné lapel pin that really pops against her dark jacket. (Photo: Mae Catt) Click to enlarge. 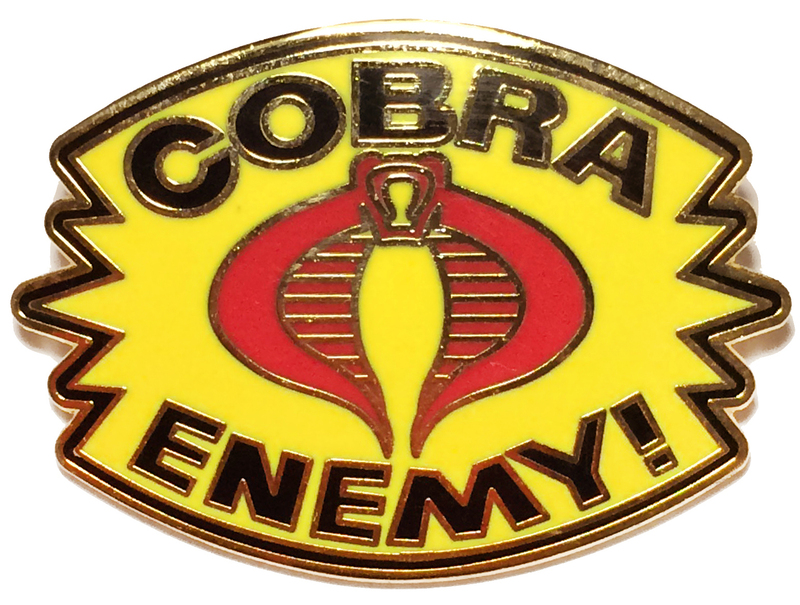 Fans and collectors of GIjOE-related collectibles and ephemera will be thrilled to learn that there is now an exciting new (little) item they can now add to their already growing stash—a tiny cloisonné lapel pin emblazoned with a “Cobra Enemy!” warning in bold black lettering which is set against a bright yellow “starburst” background and red cobra logo (see closeup below). POW!! !— As this super close-up reveals, the quality of Mae’s new “Cobra Enemy!” cloisonné lapel pin is top notch all the way. Resistance is Futile! (Photo: Mae Catt) Click to enlarge. 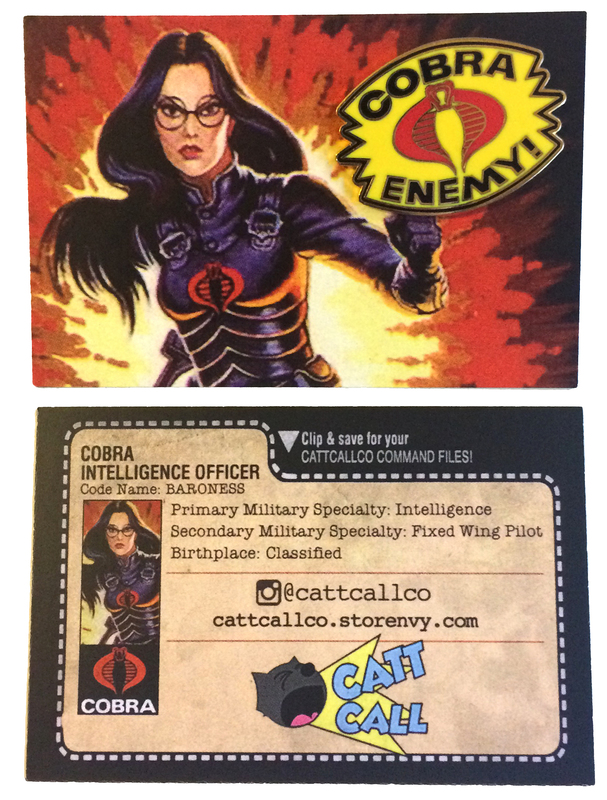 Mae’s “Catt Call” business card is cleverly designed to resemble the backing cards of the old Hasbro 3.75″ action figure packaging. Sweet! (Photo: Mae Catt) Click to enlarge. “But rather than watch that (dumb) live-action movie—we downloaded the original animated movie instead and watched it on a laptop in a hotel room. I had no preconceived ideas of the context of GIjOE, Cobra or that movie, but I decided it was just good enough (and overtly ridiculous enough) to inspire me to look it all up on Wikipedia. That’s when I discovered the absurd INSANITY of the Cobra Commander. I soon became ‘charmed’ by the character’s willpower and villainy I suppose, and have been a huge fan of the Cobra phenomenon ever since. Back in the ‘ol US of A, I sought out friends who were actually alive waaay back in the 1980’s, and was ‘properly’ introduced to the amazing world of GIjOE and Cobra through catered screenings of the TV episodes. Now, more recently, I’ve also gotten into the lapel pin craze that’s going around. 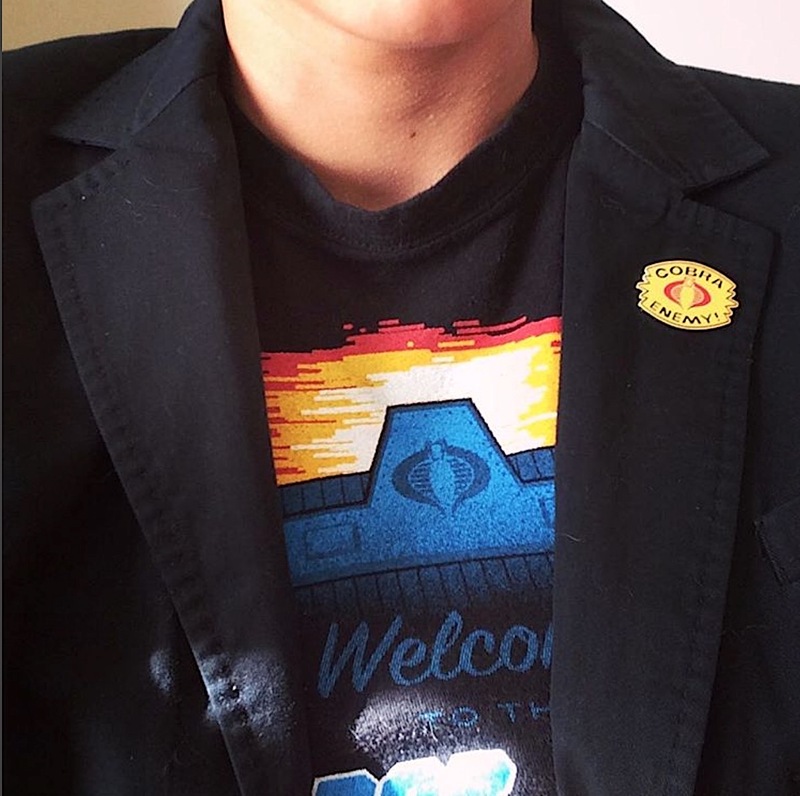 Have you seen the increased amount of collector’s pins at conventions? Well, the scene over on Instagram is going crazy right now. Pins seem to hit a button inside me. They’re a very subtle, classy way to express your fandom on formal wear, and I latched onto pin collecting almost immediately. The next step of course, was to start making pins myself! 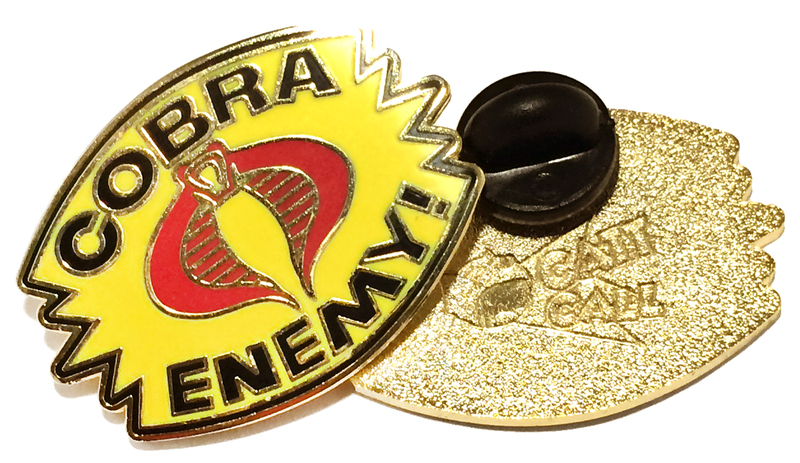 The second pin I ever made was the Cobra Enemy pin. It’s gold plated, 1.25″ wide, painted with hard enamel (meaning smooth) and the design is something I’d wanted to make into a pin since, oh… forever. Any way you look at it— The new “Cobra Enemy” lapel pin from Catt Call Co. is a definite WINNER. Our advice to you? Order yours today! (Photo: Mae Catt) Click to enlarge. Bottom Line: If you don’t already own this very cool pin, we’ll bet you’ll be ordering one very soon. It is a truly ROCKIN’ collectible that looks great on any GIjOE fan’s cap, convention shirt, or vest. Our sincerest thanks and best wishes to Mae Catt for her generous contributions to this article. 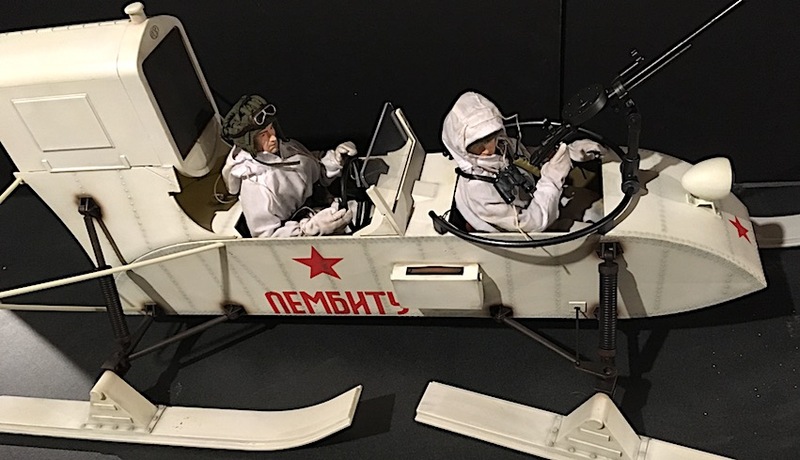 Da, Comrade!— Custom 1:6 scale Dragon Russian Aerosan vehicle with added ProSeries waterslide decals from Patches of Pride. Out-STANDING! (Photo: Kent Middleton) Click to enlarge. 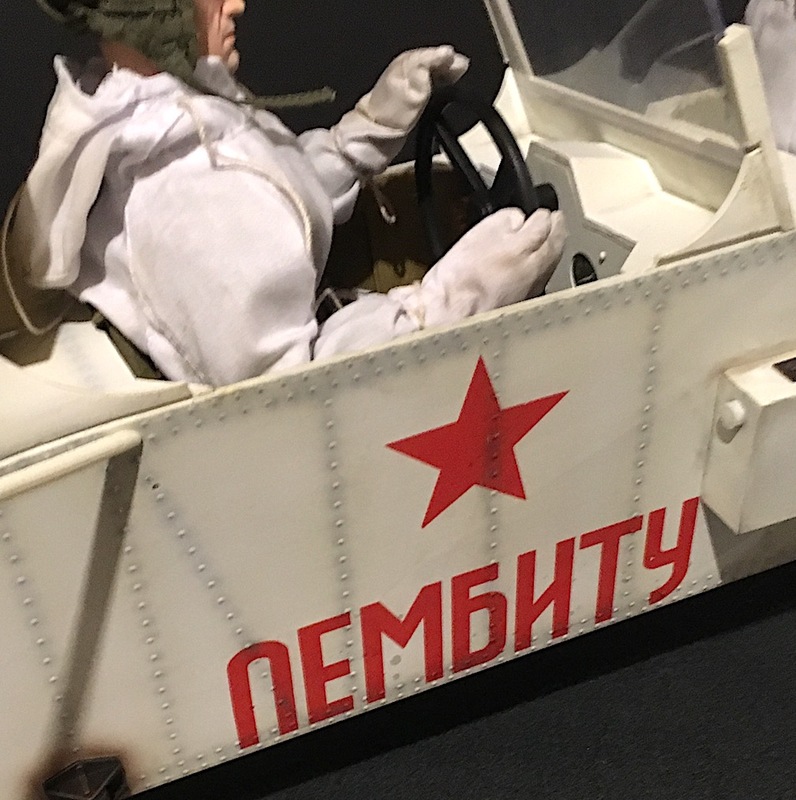 It may seem obvious to most fans of The Joe Report, but a few of you “lay readers” out there may still not realize the extreme ease with which decals and other such markings can improve and upgrade items in your 1:6 scale collection. Whether the markings in question are hand-painted, comprised of traditional “peel-n-stick” papers, or output as high-end “waterslide” decals, there’s no questioning their ability to put the “WOW” factor into any custom project. For example, tattoo decals can add realism and character to any action figure’s body. Instrument panel decals can add a whole new level of realism and playability to a vehicle’s interior. And without a doubt, exterior body or hull markings can go a LONG way towards upgrading any custom vehicle, aircraft or watercraft. As Nike says— JUST DO IT. For example, Kent Middleton, recently sent in some exclusive photos showing us the progress of his custom Dragon Aerosan project. A quick (and jealous) look at the pics reveals that Kent’s new custom snowskipper has been dramatically enhanced with the addition of waterslide decals produced by 1:6 scale manufacturer, Patches of Pride (PoP). It’s amazing what the addition of a simple red star can do for a custom aerosan. Without it, you’d have to guess which force was behind the wheel (and machinegun). (Photo: Kent Middleton) Click to enlarge. Quality Counts— This super close-up reveals the amazing realism provided by PoP’s top-of-the-line ProSeries waterslide decals. In fact, they look painted on! (Photo: Kent Middleton) Click to enlarge. 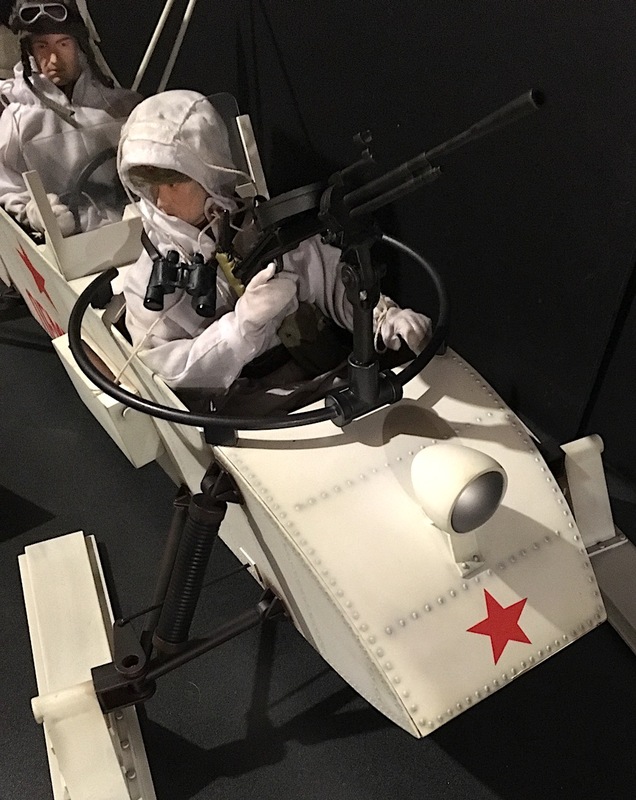 Truly Transformative— As this screenshot from the Patches of Pride website clearly demonstrates, a little paint and some professional waterslide decals can make a stunning difference in even the smallest 1:6 scale items. Which pile of ammo cans would YOU prefer to display? (Photo: PoP) Click to enlarge. Bottom Line: When working on any 1:6 scale custom project, it’s important to keep in mind that tiny items like ammo cans and mammoth items like Panzer Tanks can all benefit from the creative addition of decals and/or other types of exterior markings. If your hand or art skills are limited, then we recommend you seek out the assistance of 1:6 companies whose products are proven and can help your next custom project look its best. Remember—Details Matter!